Instead of blowing away investors with production growth, the Big Oil giant increases its profits by utilizing the entire oil and gas value chain. The investment case for ExxonMobil (NYSE:XOM) has always been one that focuses on the very long term. Most of the time, that can come at the detriment of short-term results. That had certainly been the case so far in 2018, as the company produced lackluster results. 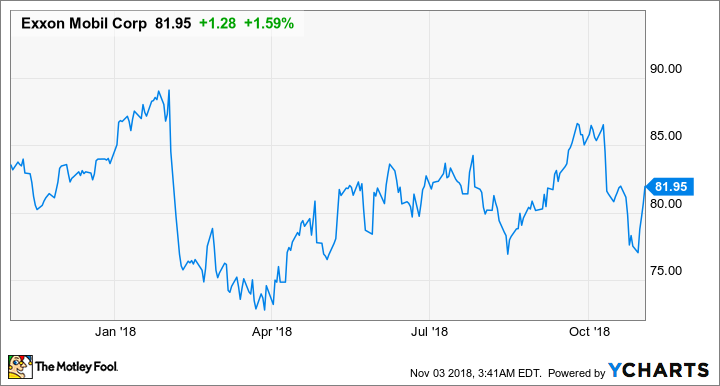 This past quarter, though, some of the things ExxonMobil has been working on over the past several years started to materialize and led to a much better-than-expected earnings result. Let's look at what the company did this past quarter to go from routinely disappointing earnings results to a pleasantly surprising quarter, and what it means for investors from here on out. DATA SOURCE: EXXONMOBIL EARNINGS RELEASE. EPS= EARNINGS PER SHARE. After several consecutive quarters that probably left investors with headaches from smashing their heads on their keyboards, this past quarter's result was a breath of fresh air. Even though the company's production numbers won't wow anyone, Exxon grew production in the right places with higher output of oil and less North American natural gas, which has been a real drag on profitability. As a result, the company benefited immensely from higher price realizations on its oil production and turned its U.S. upstream earnings into a significant profit center instead of a drag on earnings. What was equally impressive was the company's downstream and chemical segments, which were able to capture value from oil price discrepancies both in the U.S. and Europe. The only reason its chemical earnings were down was because of major scheduled downtime at its Singapore chemical complex. Data source: ExxonMobil. Chart by author. ExxonMobil's production numbers finally hit a bit of an inflection point this past quarter. Even though production was down about 2.6% from this time last year to 3.78 million barrels of oil equivalent per day, its production was up 5% from the prior quarter, when excluding maintenance and divestment effects. Management had said on the prior conference call that the second quarter was going to be the end of its production declines, and it looks as if that was indeed the case. ExxonMobil announced a ninth discovery at its exploration block in Guyana. The field has already been assessed at 4 billion barrels and is likely to be upgraded soon after the announcement of this recent well. Management has deployed a second drillship to the region to accelerate exploration efforts there. The company also announced that it had completed upgrades at its Antwerp, Belgium, and Beaumont, Texas, refineries to upgrade an additional 95,000 barrels per day of high-sulfur residual oils to low-sulfur diesel and gas oil. Exxon made these upgrades in anticipation of new marine shipping rules that will require ships to reduce the sulfur content of their fuels by 2020. ExxonMobil also won more acreage in Brazil during the most recent offshore auction. The 71,500-acre block brings ExxonMobil's total holdings there to around 2.3 million net acres. Management announced it had signed an initial framework deal for a new major chemical complex in China that includes 1.2 million tons of ethylene production to feed facilities that will produce polyethylene and polypropylene. The price tag for the facility will be given when management makes a final investment decision. The New York Attorney General has filed a civil suit against ExxonMobil, charging that the company, according to the suit, "misled investors regarding the risk that climate change regulations posed to its business." ExxonMobil joined the Oil and Gas Climate Initiative, an organization of oil and gas companies looking at ways to mitigate the risks of climate change with a focus on carbon capture, methane emission reduction, and transportation efficiency. The board of directors approved a 6.5% increase to Exxon's quarterly dividend to $0.82 per quarter, or $3.28 annually. The overarching theme for this past quarter was the benefits of integration and the ability to squeeze more profit out of each barrel. On the quarterly conference call, Jack Williams, senior vice president of chemicals and downstream, highlighted how its logistics, refining, and chemical production is generating a lot of value from its production in the Permian Basin. [T]oday, we have the ability to run 450,000 barrels a day of light crude in our Gulf Coast refining circuit, and this has provided ample incentive to secure efficient transportation capacity to our refineries well in excess of equity production from the Permian. Currently, we have about 270,000 barrels a day of committed capacity and that's likely going to grow further in the coming quarters. And the 450,000 barrels a day is growing, too. In addition to the Beaumont expansion, we're working on some other smaller de-bottleneck projects to add about another 50,000 barrels to ultimately take our Gulf Coast light crude processing capacity to over 750,000 barrels a day. And then in addition to our three Gulf Coast integrated facilities, we run Permian crude at 10 other sites outside the U.S., including our Singapore crude cracker. [...] Year to date with the actual environment we're seeing, we've made well over $1.2 billion across this value chain. And it's clear from the current environment, highlighting the value of our approach in the Permian. You can read a full transcript of ExxonMobil's conference call. A prelude for things to come? One of the most frustrating things about Exxon's results over the past few quarters has been declining production. While other Big Oil companies were growing production at eye-popping rates, Exxon's was slowly dwindling from a combination of project timing, natural field decline, and a deliberate winding down of U.S. natural gas production. This past quarter, though, the company proved that it doesn't have to grow production at a high rate to generate loads of cash. The focus on getting the most value out of every barrel produced through logistics, refining, and processing is very much a reflection of the mindset of CEO Darren Woods, who spent decades on the downstream side of the business. It's still going to take a long time for some of ExxonMobil's largest and most profitable projects -- Guyana, Mozambique LNG, and Brazil -- to start operations, so investors today should still have their eyes on 2021-2025 as these production sources go live. In the meantime, the company has a way to generate ample profits that will make its quarterly results much less frustrating than the past few.